What is there to say and teach about such a familiar story? Plenty! Our team has written six unique "workshop" lessons that explore various aspects of the Magi's Visit using a variety of very creative approaches. The lesson plans themselves are open to our Supporting Members whose gifts make these lessons and our site possible. 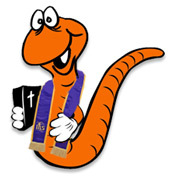 Join today. Traditional Sunday Schools can pick any workshop knowing the full story is told. But since you know this won't be the first or last time they'll ever hear the story, why not pick the one lesson that will really stand out as something different from what you normally do? Rotation Model Sunday Schools can confidently rotate through four to six of the workshops knowing that each covers slightly different ground in the story, emphasizing new insights, while still teaching the whole of the story. Teens classes, Advent "Family" Nights -- several of the workshops are easily adaptable for special Advent programming. A number of the Writing Team lesson plans explore NEW teaching techniques as well as give new life to familiar ones. "Selfie" Bible stories? ~ Foil sculptures? ~ A karaoke-style singing reflection? See the lesson summaries below for highlights and click the links to see and print the lessons! Be sure you read the Bible Background for the lessons in this set. We've written a Bible Background that's full of information and surprising insights to share with your students. It explains the origins of the Magi, why they are called "wisemen" or "Kings," what the star and gifts are about, and much more. The Background even explains how to actually pronounce the word "Magi" ! Every lesson in the set assumes the teacher knows the Background. Everyone can read the Bible Background for this set. Supporting membership is required to view the lesson plans. 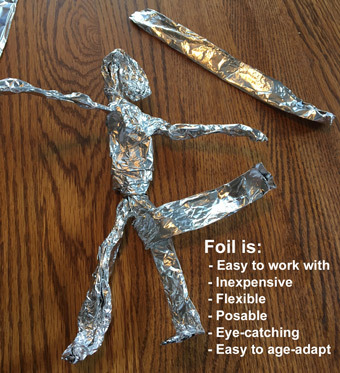 Common aluminum foil is a fantastic sculpting medium for a lot of reasons, and its flexibility will come in handy as your students learn the "hidden" meaning of Matthew 2:11's familiar words, "they bowed down and worshiped him" through both a movement activity and then a foil sculpting activity. This lesson features three game "stations" for your kids to travel through, recapping the story, and taking a silly but serious look at the CAMELS who weren't mentioned in the story, but carried the Magi and treasures to Jesus. You are called to be a camel, too. Are you a fast camel? I guess we'll find out. This amazing cooking workshop features your students quickly making and baking a King Cake so they can share the goodness of the cake and its message with family and friends. King Cakes are a traditional part of the season of Epiphany which concludes with Mardi Gras (Fat Tuesday). This lesson not only has an amazingly quick and tasty recipe (complete with the hidden Christ figurine), it includes the traditional colors of Mardi Gras which correspond to the three gifts of the Kings. 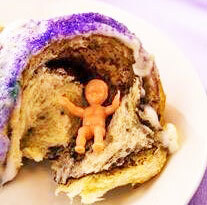 Do you think it helped that two of our King Cake lesson writers LIVE in Louisiana? OUI! This lesson was written both for those with only one computer and for those with many. It uses a fun piece of Bible software to explore the entire story and focus in on the meaning of the Magi's gifts, and those gifts young people can bring. 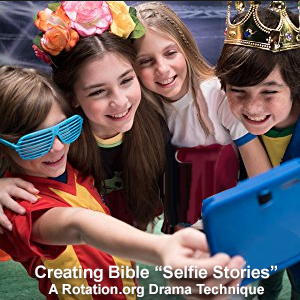 This lesson teaches your teachers a great way to have their kids retell Bible stories --through the ever popular SELFIE! After they punctuate the scripture reading with their own selfie reactions, they turn to a creative Selfie Booth reflection activity for more personal reflection. Complete instructions, including tech tips for activities like "Selfie Bible Stories," are a hallmark of this and all Writing Team lessons. Wow! Where do we start? Using the time-honored technique of looking for sacred themes in popular secular films, after viewing a neat animated retelling of the Magi's story, your students view two animated music-video clips from Disney's Moana. Moana is a young girl feeling the call beyond the reef -a call which will lead her on a journey that will ultimately save her people. 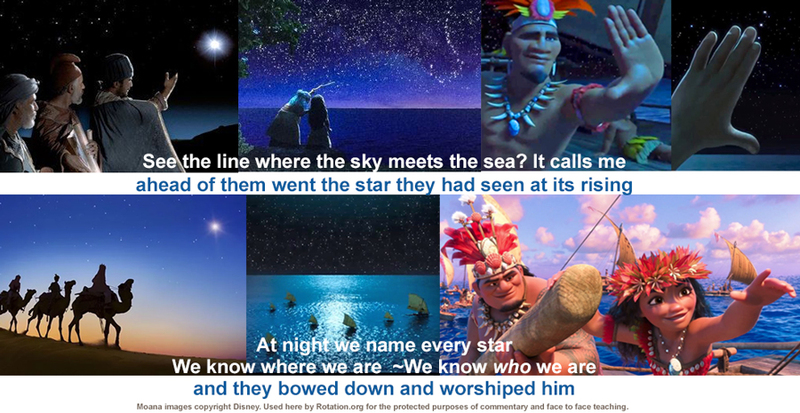 After viewing and the discussing these first three short clips, students will view a fourth video clip created just for this lesson that "mashes up" the story of Moana and the Magi in a dramatic and memorable way. Did we mention that all four of these videos can be viewed online for free? This Video Workshop concludes with a unique singing Reflection Activity that offers new words to one of the most popular and dramatic songs in Moana. Do you "know who you are?" Did you know Moana's songs were written by Lin-Manuel Miranda, the composer of Hamilton? Every lesson in this set has age-adaptation notes and suggestions for what to skip or reduce to fit into a shorter class time. We loved writing this lesson set and welcome your questions and suggestions. Post them in the workshop topic. The actual lesson plans are only available to our Supporting Members because it is their generosity and faithfulness that makes the Team and our entire site possible. Become a Supporting Member today! ...with contributions by many more. Text Copyright 2018, Rotation.org Inc.